This is something I've posted about before that is absolutely driving me nuts!!! The saw is about 14 years old, I'm a one man shop so fairly low usage. On start up the blade can sometimes be seen jerking a bit. After doing all I could, called in a repair company. They too are perplexed! Replaced belts and bearings in motor and arbor, checked voltage, inspected everything for loose bolts or visible cracks, etc. 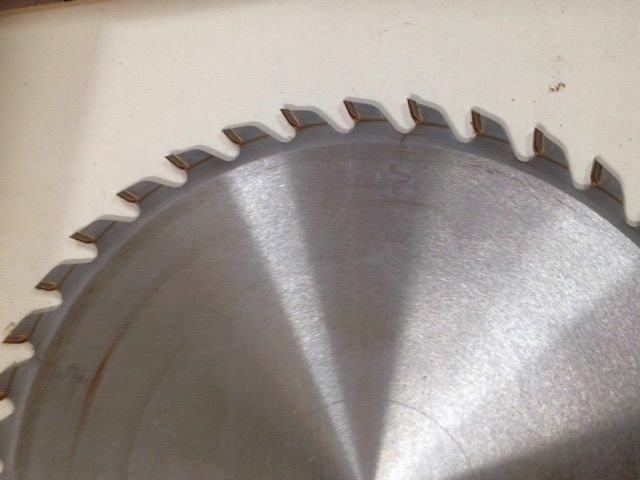 Checked with different blades to rule that out and added a blade stiffener (4") but problem persists. If I make a zero clearance plate it will be chewed up within a week. I've attached pictures of what the blade looks like after about an hours use ripping/crosscutting hoping that it may indicate something to someone of you out there. Cleaned it and you'll notice a line that forms just below the teeth -- does that mean anything? 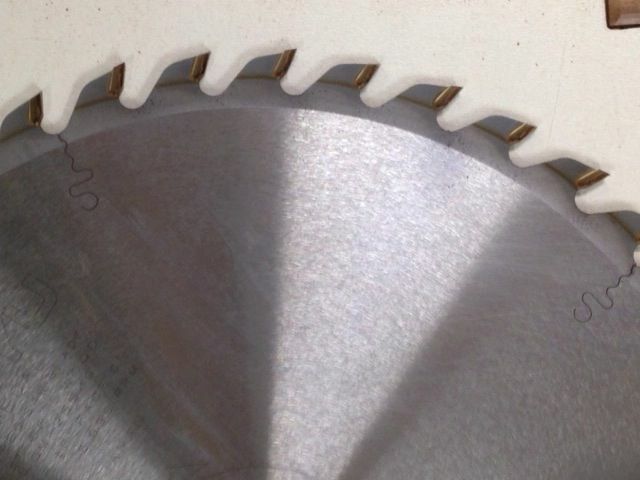 I'm wondering if it's time to buy a new saw, I wouldn't mind replacing it with a smaller unit since I'm not doing that much with sheet goods -- any suggestions would be greatly appreciated. Look at the way the trunnion is mounted to the cast iron saw table. On older Delta contractor saws this was a sloppy setup. Perhaps there is something there that is allowing movement. Another thought is a bad motor winding or starting capacitor that is intermittently causing a serious jolt to the motor during start up. This would actually be my best guess as to the cause of the problem as it does sound like a motor jolt problem. Thanks B.H., I've thought along those lines of the motor since sometimes there is almost a "bark" like sound when it starts up. I'll check those trunnions too. Probably not much can be done about the motor other than replacement! When I had the tech out he did check the incoming voltage to be sure there wasn't any jump there --- may have to live with it but since I'm in Las Vegas and am going to AWFS who knows….. When you go to AWFS be sure to visit with the folks at SawStop. A big investment but the benefits of owning one are huge. A few more thoughts on your problem. I'd be inclined to open up all the electrical boxes and look for a loose or breaking wire. Look in the magnetic starter control box, the on/off button switch box, the motor electrical connector box etc. Keep an eye out for anything that looks like it might have been arcing. Unplug the saw before opening any of these up to be safe. Failing all else you could pull the motor and take it to an electrical repair shop to check out. These though are getting harder and harder to find as the owners age out and aren't being replaced by new people. Cheap import motors of course have a huge affect on this situation. Good idea BH, I'll check the connections for that. Since it's on a dedicated 220 circuit I'll check the wall outlet as well. When the repair guy was here he did take the motor to the shop so I'm assuming he ran whatever tests needed on it then. You may also want to make sure there are no anomalies on the sheaves, and that the belts are in good shape. We recently found a vibration problem on our jointer was primarily from really worn belts. One more thing. You mention that after a week a new zero clearance insert is chewed up. Assuming the bearings are ok I'd take a close look at the blade arbor mounting system. Even with a bad electrical connection the blade/arbor assembly should remain true. I'm wondering if you don't have a couple problems with the saw. An electrical issue that that is causing the intermittent slamming at startup and slop in the mounting somewhere causing the arbor assembly to shift.